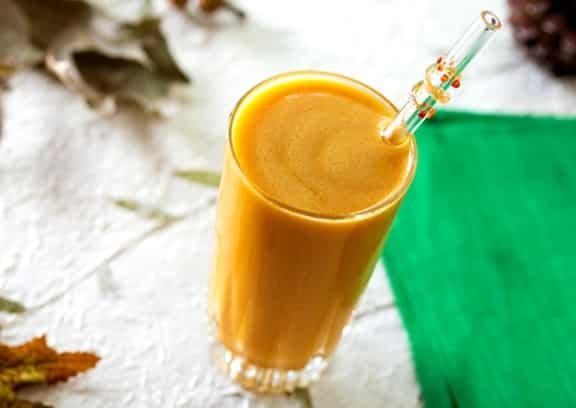 This mellow smoothie tastes like a liquid version of a delicious pumpkin pie — the secret being that butternut squash makes better pumpkin pie than pumpkin itself does. 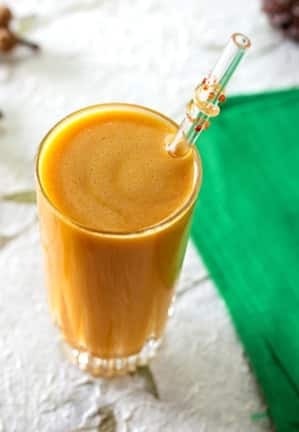 Gently spiced with cinnamon and ginger, this smoothie is packed with flavor and gives you a generous dose of vitamins A and C. It might well become your go-to fall and winter smoothie! Photos by Hannah Kaminsky of Bittersweet Blog. Combine all the ingredients in a blender and process until smooth. Serve at once at room temperature. If using a high-speed blender, and you have the means to cut up a raw butternut squash, you can start with 1 1/4 cup chunks, unbaked. See VegKitchen’s video on how to prebake whole butternut squash so that it becomes easy to cut. Bake it a little more than the video instructs — you want to be able to pierce the narrow part through very easily. Variation: You can use sugar pumpkin or golden acorn in place of the butternut; this is best with good, sweet squash. Here are lots more ways to enjoy winter squashes. I love the idea of this, but there was just too much pulp. I didn’t cook the squash before putting it in the blender, so that might be why. I would definitely advise baking it first. Vanessa, the recipe definitely calls for the squash to be well-baked and mashed. I think the raw flavor would be less appealing, too. Try it the way the recipe calls for next time, and report back if you’d like! By high-speed do you mean like the Vitamix that makes soup? And the squash would actually cook on that setting? Barbara, yes to both. But if the mixture gets a bit too warm to be a smoothie, you can throw in a few ice cubes. Hi, I made this in my Froothie high speed blender and added a few ice cubes, but the squash was still raw and it worked fine. Vicky, did it have too raw of a flavor? This recipe was a great way to start my smoothie. I cut and roasted the butternut squash with cinnamon, spinach, fresh orange juice, mangos, ginger and almond milk. Ubber yummy! Thanks! Kaya, sorry for the delayed response. Love your variation ideas; they sound amazing! Too many ingredients. Why do you need orange juice AND liquid sweetener? Why do you need nut milk AND nut butter? Doesn’t make sense. If it needs to be thinned out, add water. Nut milk is mostly water.